Stylish, modern and practical, the Baby VOX Milk Furniture Collection comprises a beautifully designed compactum and a convertible cot bed. This range features the same European design you would expect from VOX, with a soft finish and subtle details that further add to its style. Available in flat pack for easy assembly, this range is made to grow as your little one grows. Keep reading to find out what makes the Baby VOX Milk Furniture Collection a must-have for your child’s bedroom. With its simple lines and compact style, the Milk range is all about simplicity. The Milk compactum is fitted with a changer on top, and contemporary drawers that are easy to open and close. Made of a high quality modern laminate board, this compactum is made to last. 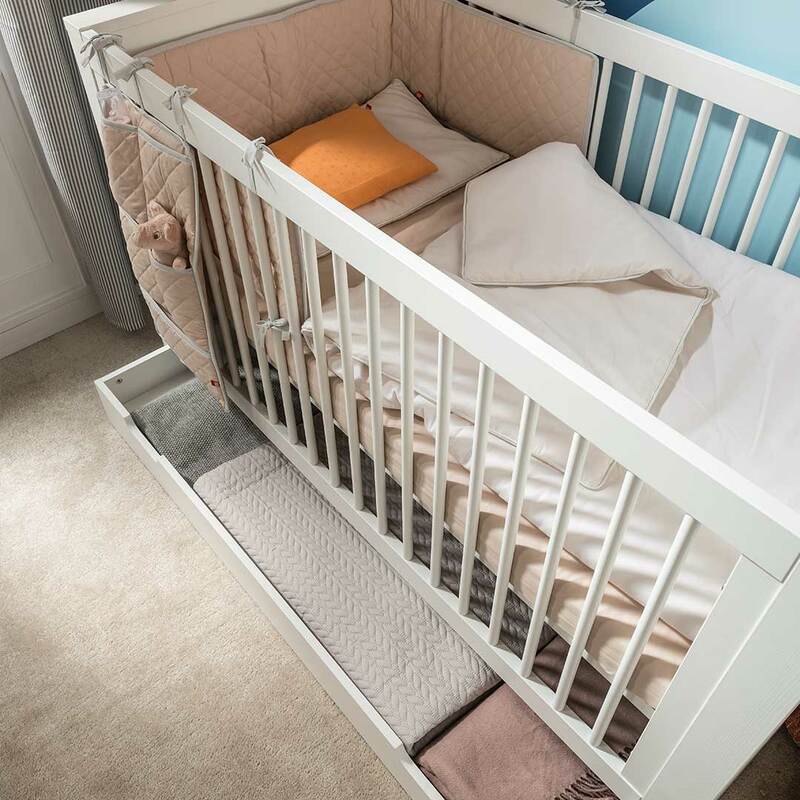 The Milk convertible cot bed, made to complement the compactum perfectly, is equally well-made, with an additional pull-out storage drawer. Furniture in this range has a clean, white finish that further adds to its style. Ideal for boy and girl nurseries, the modern look of this range goes with a wide range of decor styles, from vintage to Scandinavian, contemporary, modern boho and anything in between. The glossy finish is also easy to clean, making sure it retains its glow year after year. Versatile pieces that grow with your baby. The Milk Collection is also surprisingly versatile. If you are seeking long-lasting furniture for your baby that will take him through to the toddler and childhood years easily, this range is sure to be a good choice. The compactum’s changer can be swapped out for extra surface space as your child grows, or used to store toys, books or other items. The convertible cot bed transforms from cot to toddler bed easily, transitioning your little one flawlessly. Looking for additional ideas for your little one’s room? Browse our full range of Baby VOX collections to see what else we have in store. View the Milk Furniture Collection for detailed information on the products in this premium range.